(CIFA): One of the most anticipated matches of the 2011/2012 Cayman Premier League season got on the way on Sunday at the G. Haig Bodden Playing Field in Bodden Town when Scholars International clashed with George Town. Colin Rowe of Scholars International stated that he is pleased with the (i) attitude of the players, (ii) the training, and (iii) the result from the previous week. "The team is taking it one match at a time. We will introduce a few new players into this match and the spectators should expect a better game than the week before". Lee Ramoon, speaking on behalf of George Town, stated that, although this was an early game, it was a very important game. "Hopefully, the team will play according to how they have trained. This year, we are using a different formation-a more attacking formation-that hopefully will lead to more exciting football". One would have expected the match to be free flowing football, with each team employing tactics and strategy to gain the upper hand. Although the game was end to end action, there was no flow, as the flow was constantly interrupted by careless challenges by both teams that resulted in the referee having to employ the whistle on a regular basis. The match was very physical, with no team gaining the clear advantage. By the end of the first half the referee had issued four yellow cards. The first half ended 0:0 the only thing the game was lacking was goals at this point, the intensity and physicality of the game was worth the entrance fee alone. he second half started much as the first half had ended until Carson Fagan slotted home a perfectly placed header off a corner kick twelve minutes into the second half to give Scholars International the lead. Seventeen minutes later, however, Scholars International would be issued a severe blow when Mark Ebanks was given a red card after only just coming on a few minutes earlier. Scholars International, now down to ten men, did not skip a beat and did not adjust their strategy. They continued to pressure the George Town defence. 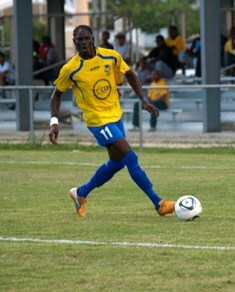 George Town shuffled the pack and brought on Kevin Moore who added width to George Town’s attacking play. Inventive attacking wing play rewarded George Town with an equalizing goal in the 80th Minute. Kevin Moore’s run and deep cross from the right was directed back into the path of Justin Pierre by Leon Whittaker, Justin Pierre delivered as most in the crowd would have predicted. It seemed that the match was destined to end in a draw, which would have been an appropriate score, when Scholars International was awarded a penalty deep into stoppage time. ONeil Taylor of Scholars took responsibility and slotted the ball home. The game ended 2:1 in favour of Scholars International who have made an impressive start to the season. In other Cayman Premier League matches on Sunday: Bodden Town came out on top against Cayman Athletic as the two most youthful sides in the Cayman Premier League battled it out at the G. Haig Bodden Playing Field. A last gasp winner from Bodden Town’s talisman Karl Solomon gave BT their first win of the season. The final score ending Bodden Town 2: Cayman Athletic 1. At the T.E. McField in George Town Roma United continued their impressive start to the season with a 2:0 victory over Future. Nicardo Beckford and super sub Ronald Emmanuel scoring for Roma.Elite dusted themselves down after their opening week defeat by taking care of Tigers 3:1. The star of the game was Elite’s number 11 Dwayne Wright, last season’s top goal scorer Wright notched up a hat trick in this game and looked a constant threat every time he got the ball.